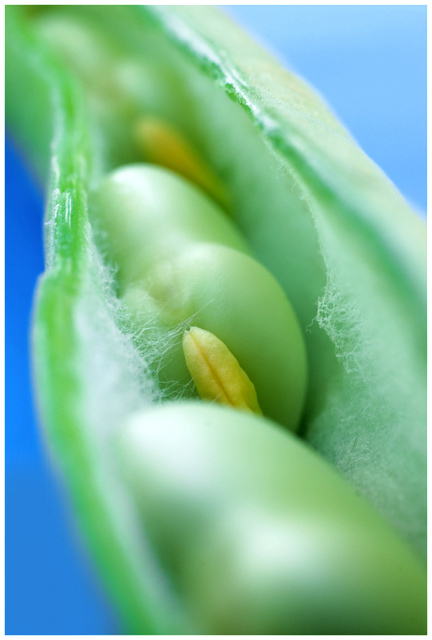 An inside look in peas in a pod. Gardenbeans to be precise. Lightning: The sun and a translusant white reflector. I used a cross nikfilter and faded the grainy surface of th blue pillow I used for the pods. First of all, let me say that I'm not a big fan of abstracts. I understand why people like them and like to creat them though. I'm more of a traditionalist myself. That said, this is simply a great shot for this challenge. The DOF is perfect for this. You have just enough sharp detail to give your eye a spot to land on. Everything else is distinguishable but soft. Perfect! Love the colors too. Very simple color scheme and lighting. I especially like how the blue goes from darker in the bottom left to lighter in the top right. Great composition. Love the way the lines lead you through the frame. The only thing that may kind of detract from the shot is the fuzz inside the bean pod, but what can you do? All in all a very nicely done abstract! Congratulations on your top 20 finish with this cradle of ovals. I gave this a 9. Good macro(? ), liked the texture/detail captured. The color combinations took a little while to get used to, but do go together well, in my opinion. very, very nice abstract. Lovely colors and composition. Congratulations on your top 20. The focus is perfect and draws me right into the center of this legume. Good focus here if your intent was to just isolate the single pea. The background colors suits this image as well giving it visual impact. It's cute, but very well done too. very nice!!! this is one of my faves!!! i like the color composition a lot. A near technically perfect photograph and artful at the same time. Excellent! Cool subject, like the shallow dof. The colouring is also appealing. Excellent focus, love the background colour, great job. Proudly hosted by Sargasso Networks. Current Server Time: 04/19/2019 12:21:31 PM EDT.